Royal Haskoning is present in many countries and as an employee, you regularly get the opportunity to go abroad. 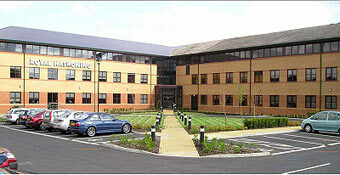 Yesterday, we had a quick visit to our GIS colleagues in our office in Peterborough (UK). Royal Haskoning is strongly persuing a “one-company-concept”. This works excellent when regarding our offices, IT infrastructure and the like. When arriving at the office my laptop connected to the wifi without hesitation and I was able to work as if I was in my home office. But providing a one-company-concept in the IT infrastructure is one thing, the differences in the cultures can be something else. And although we have regular contacts through Lync, Video Conferencing or telephone (yes, it still exists…), it is always challenging to see how these differences interfere with the conversation when discussing GIS strategies, organizational changes and recommendations to the Board of Management. As it turned out, the differences were not noticable. We had some lively discussions, even though we were talking from 9am through 3pm, and had a few laughs as well. And whether this originated in our close cooperation over the last three to four years or in the less-then-feared differences, I am not sure. And I don’t really care. All that matters is that we had a constructive meeting and we are ready to face 2012 in our joint effort to bring the application of GIS within Royal Haskoning to the next level! Since my last post on the interaction between BIM, GeoDesign, GIS and Systems Engineering some time has passed. But things have continued to develop and it’s high time for an updated view on this matter. And in English (thanks @martenhogeweg for the suggestion) for a wider audience. 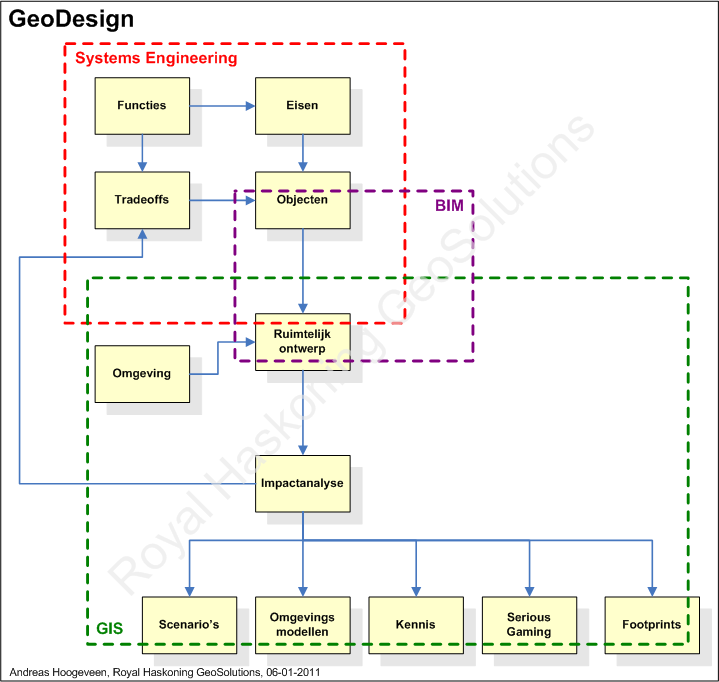 I’ve stated that BIM, GIS and Systems Engineering combine into GeoDesign. I’ll like to tone that down a little bit. Each area has a right in its own, but the real fun begins when they are intertwined and the strong points of each discipline are highlighted. The main goal stays the same: provide better spatial design (whether on a small or a large scale), based on up-to-date, complete and state of the art information, tuned to the requirements and functions the systems or object has to provide. 1. Institutionalised. The organisation is able to set up procedures and provide technologies and enforce a cooperation. 2. Spontaneously. In a knowledge driven organisation like Royal Haskoning, experts operate in a social network based on relationships and knowledge of each other’s capabilities. Curious colleagues are looking for new connections all the time, and in this way, the cooperation grows. Both ways are necessary: the drive to cooperate comes from within the leading experts out of curiosity, and the organisation has to provide in means and technology to enable the cooperation. At Royal Haskoning, the second way definitely has taken shape, but now we have to move on and develop the first way of cooperating. 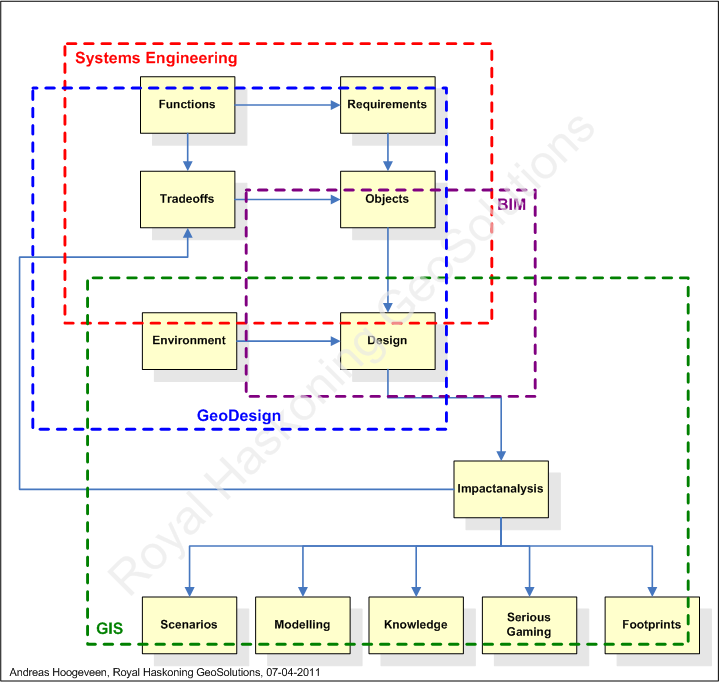 In the figure below, I’ve elaborated a little bit on the interaction between GIS, GeoDesign, BIM and Systems Engineering. The figure is obviously based on the figure in my previous post, but the disciplines are more equally present. – GIS for providing general information, performing spatial analysis, performing impact analysis, and (in short) tying everything together. In my opinion, any organisation that can successfully tie these things together and apply them in any (spatial) design or development project can achieve very high-profile and sustainable results! GeoDesign + Systems Engineering + BIM + GIS = ? Vandaag viel alles op zijn plek. Vanuit de Systems Engineering collega’s (waarvoor wij al sinds vijf jaar een applicatie in de lucht houden voor het informatiemanagement) werd gevraagd om GIS, onze collega’s die zich met BIM bezig houden zijn ook op zoek naar GIS en vanuit de GIS zijn wij bij GeoSolutions bezig met scenario’s, impactanalyses, serious gaming en (carbon/water/sustainability) footprints. En daaroverheen onze wens om met GeoDesign bezig te zijn. Na een uurtje brainstormen met een aantal SE/BIM/GIS collega’s kwam ik tot het bovenstaande plaatje. 1. Je ontwerpt iets (een stadswijk, een brug) volgens de SE systematiek. Oftewel: het te bouwen object wordt benaderd als een systeem, dat bepaalde functies heeft, dat aan eisen moet voldoen en dat opgebouwd is uit sub-systemen, componenten en weer kleinere onderdelen. 2. Je houdt rekening met de omgeving en gebruikt GIS om alle (geografische) kennis van het gebied ten volle te benutten in het ontwerp, ook rekening houdend met de impact van verschillende ontwerpkeuzen. 3. Met BIM beheer je de informatie over de objecten en voer je berekeningen uit om kosten te besparen, efficiënter te werken, goed projectmanagement te voeren en inzicht te krijgen in het ontwerp. En conform de SE gedachte is dit proces natuurlijk cyclisch: na de impactanalyse ga je het ontwerp specificeren en tot in meer detail uitwerken, waarbij het hele proces weer doorlopen wordt. GeoDesign vat ik dan wel breed op, namelijk: vanuit de ruimtelijke kwaliteiten van een gebied een goed ontwerp maken. Dat GIS hierbij een kernrol speelt, is duidelijk (tja, je bent GISser of niet). Maar het omvat dus ook de ontwerp systematiek (zoals SE) en het beheren van detailinformatie van je ontwerp. Dus, met een verwijzing naar de titel van dit artikel: GeoDesign + Systems Engineering + BIM + GIS = Ruimtelijke ontwikkelingen perfect ontworpen!